As we jump into 2017, the new year debuts new recipes inspired by local spots and seasonal ingredients. One of my favorite neighborhood spots is Area Four in Cambridge. Whether stopping in for their A4 Sausage and Pickled Banana Pepper pizza or morning Frittata breakfast sandwich, they make most everything in-house with quality, fresh ingredients throughout the day and evening. 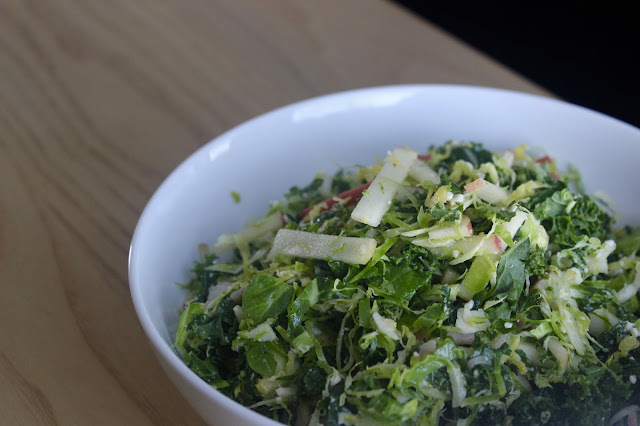 While their pizza is my favorite in the Cambridge area, another go-to dish on their menu is the A4 Brussels Sprout Salad. The cascading sea of curly greens is packed with flavor, texture and pairs perfectly with a bubbling pie from the brick oven. At a recent family dinner party with my siblings and significant others, I decided to serve my own take on the salad alongside lemon and oregano roasted chicken and potatoes. Our plates popped with citrus, fresh flavors and vibrant colors. The thinly sliced veggies melded wonderfully with the tart apple matchsticks, sharp Manchego cheese and toasted hazelnuts. This busy salad will be a big hit at your next dinner party! To make the dressing, whisk together the lemon juice, Dijon mustard, shallot, garlic, a pinch of salt and pepper in a small bowl. While whisking, slowly pour in the EVOO and allow to emulsify. Set aside. 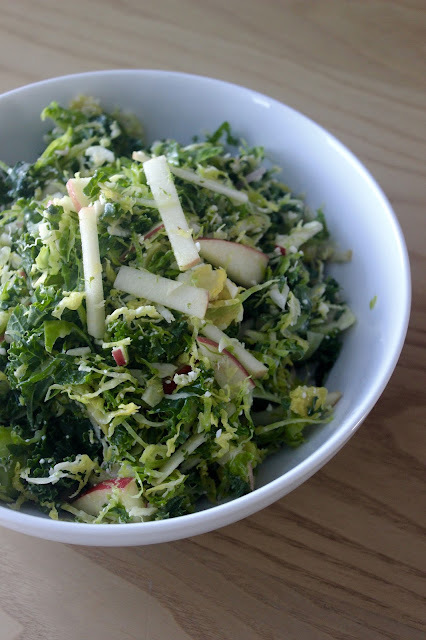 In a large mixing bowl, toss together the chopped kale and sliced Brussels sprouts. Add about 1/2 of the dressing, and use your hands to massage the dressing into the greens. Taste and add more dressing as needed (you may not need all of it). Let sit in the refrigerator for 15-20 minutes. Before serving, add the the apple, radishes, cheese and remaining dressing. Toss together to combine and season to taste with salt and pepper. Transfer to a salad bowl, and sprinkle the hazelnuts on top. Feel free to add grilled chicken, salmon or a skewer of shrimp on top to further amp up this super salad!